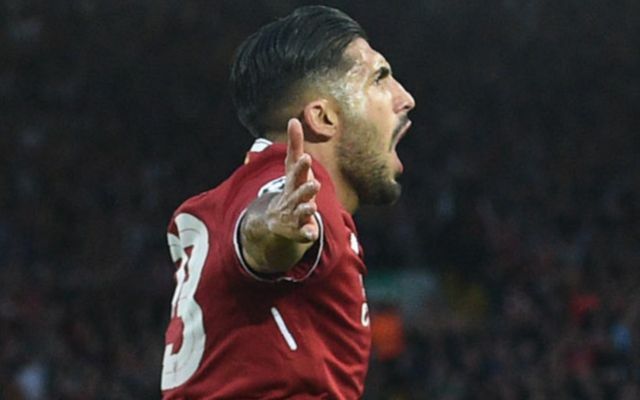 Liverpool secured their place in the group stages of the 2017/18 Champions League, as the Reds hammered Bundesliga side Hoffenheim 4-2 at Anfield tonight, with German midfielder Emre Can scoring two for the home side and picking up MOTM in the process. Liverpool opened the scoring in the 10th minute of the match, as winger Sadio Mane cut in from the left before giving the ball to Can via a glorious back-heel, as the German fired the ball past Olivier Baumann in the Hoffenheim goal to ease the nerves of the home faithful. New signing Mohamed Salah then doubled the home side’s lead just eight minutes later, as the ball fell kindly to former Roma star after a fierce strike from Georginio Wijnaldum smashed off the post, leaving the Egyptian to hit the ball into the empty net to put the Reds 2-0 to the good. Liverpool then put tie out of sight three minutes later, as another fine back-heel from Mane found Brazilian Roberto Firmino, who crossed the ball to Can, who slammed home with his left foot to leave himself on a hat-trick with just 21 minutes gone. The away side then pulled one back seven minutes later, after Mark Uth found space in the Liverpool area before slamming the ball past Simon Mignolet’s right-hand side to give the German side a glimmer of hope. Jurgen Klopp’s side then put the tie out of sight with a fourth, as Jordan Henderson stole the ball off centre-back Kevin Vogt 30 yards from goal, before the Liverpool captain put the ball across to Firmino to gift the Brazilian his only goal of the night. The German side then scored a consolation in the 79th minute, after former Leicester forward Andrej Kramaric floated a ball into the box to allow striker Sandro Wagner a chance a goal which the German took, as he headed in from 10 yards to ease the pain for the travelling away fans. The win ensured Liverpool’s place in the Champions League proper for the first time since the 2014/15 season. For the home side, it’ll come a big boost, as their qualification for the group stages will allow them to offer certain Champions League football to any potential targets they want to go after during the remainder of the transfer window. For the away side, this two-legged affair will come as a big loss, as Julian Naggelsman’s side will look to concentrate on improving on the 4th placed league finished they manage to secure in the Bundesliga last season.